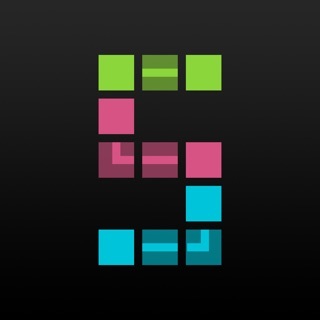 Super Squares™ is a patented live sports gameshow for smart phones. 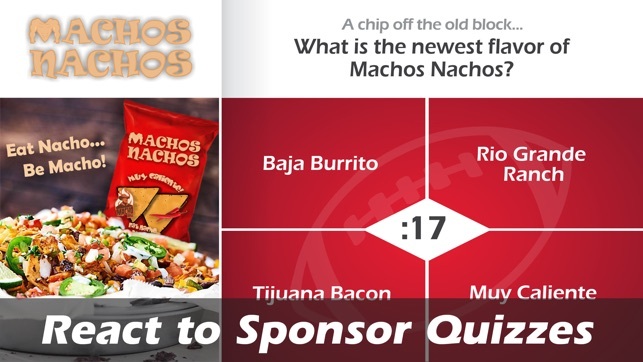 Part TV game show, part football squares, with just a hint of fantasy football, Super Squares™ provides casual and passionate sports fans alike with something fun and rewarding to play when football games go to break. 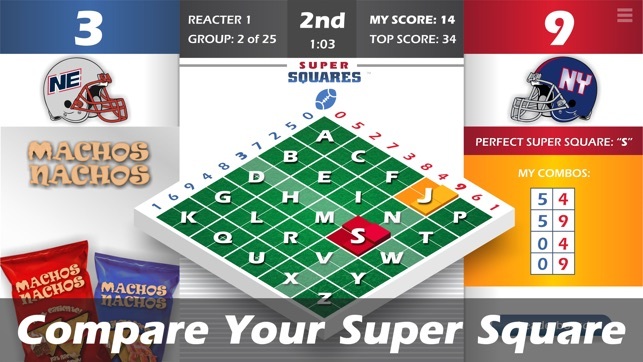 Super Squares™ is easy to play, and complements watching (or listening to) live football games. 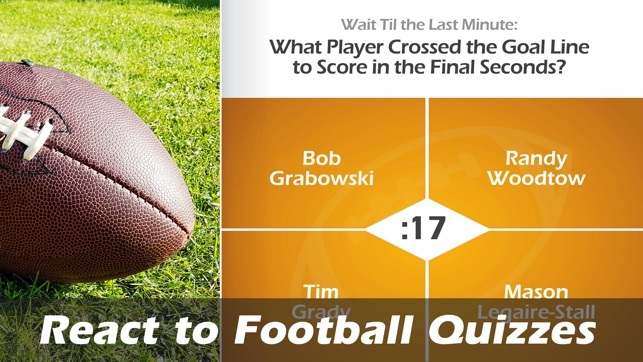 Players join a Super Squares™ Game Show before kickoff, and then “Check In” during 6 Game Breaks, coinciding with the end of quarters and 2:00 warnings. 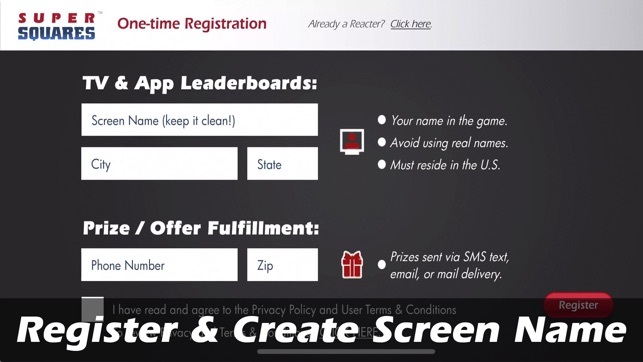 During each game break, players collect points from “Reactive Quizzes” that reward them for paying attention to the game and in-app Sponsors’ ads. Players then match their “Super Square” against the football game’s score. The more questions answered correctly, the more Leaderboard and matching square points players earn. 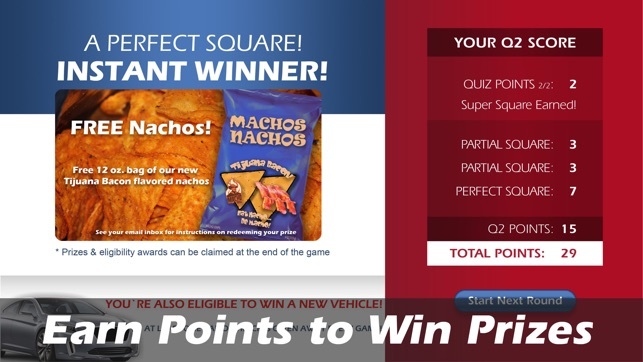 Super Squares™ live Game Shows are free to play, yet provide 10 ways for players to win, including prizes each Game Break, prizes for dominating group and national leaderboards, and a new car or truck at the end of most tournaments. NOTE: Prizes are NOT fulfilled within the app – players must be validated after a Game Show to receive prizes. No purchase necessary. Super Squares is a free-to-play skill-based game show; there is no ability to pay or wager within this application. Open to adults 18 years or older who are residents of the United States. Prize eligibility may be restricted geographically. 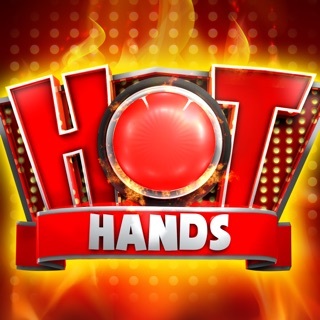 Check www.SuperSquares.com for restrictions, and details about the next live Game Show tournament in your area. Super Squares™ is a trademark of Media IP Holdings, LLC. The Super Squares™ Game Shows and App are protected, in whole or in part, by U.S. Patents Nos. 6,606,745, and 9,858,764 and features are disclosed and claimed in a number of other patents pending. Love that it gives me a reason not to fast forward thru commercials! Looking forward to winning! They need to fix bugs, I should have received points and never did. They lost my letter and said I never checked in even though I had a letter. Finally - on iPhones too! Kudos to you - love playing on my iPhone!